Organized and supported through FAR’s Breaking the Cycle of Poverty Program (BCPP) and implemented in the Berd Region of Tavush Province, the painting group decided to show their work in honor of International Women’s Day. Led by the school’s art teacher Siramarg Aydiyan, the group of 20 kids (ages 10-15 years) meets twice a week. Each student painted something in honor of their mothers, which also related to spring. Upon showing their work, some found they were pushed to work even harder, however. Thirteen-year-old Sevak Simonyan was excited to see his mom’s response to his painting. “I painted tulips as a way to put my mom in a good mood and bring a smile to her face. But when she looked at it she said ‘Good for you, but you can do more,’” he said. Sevak has been attending the group for nearly three years. He likes to draw in black and white; light and shadow prevail in his paintings. “I used to attend drawing classes, but then the group fell apart. I was happy to be accepted into this painting group once I learned about it. I like to draw animals. The beauty and strength of the wolf appeals to me the most,” said Sevak, who has a pet dog and a dove at home. Mariam Marikyan, a Teach for Armenia fellow who teaches history at the school, was the event organizer. The extracurricular classes have helped the students to be more active and to unleash their potential, she said. “The spring flowers, the sun and the landscapes were like a love proposal with pictures,” she said, adding that the group also helps to shed light on the gifted talents who may become brilliant painters in the future. BCPP focuses greatly on investment in the children of region, empowering them with the tools they need to create better futures for themselves and their communities. Improving education and its accessibility is a key component of the project, and finding creative outlets in an area where there are few to no opportunities is a part of that. 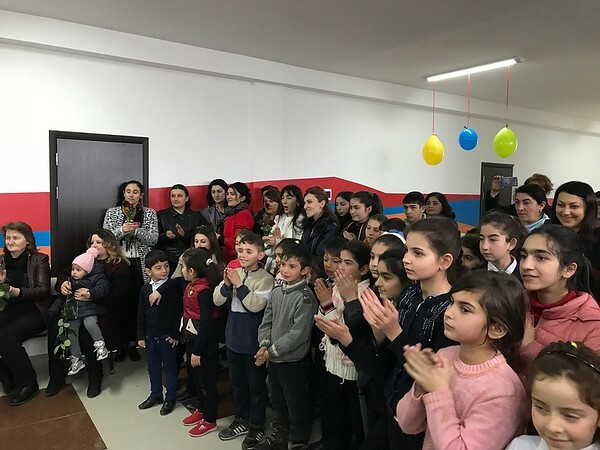 FAR Education and Science Programs Director Eduard Karapetyan highlighted the talents of the children of Nerkin Karmiraghbyur. “They often make us proud, which is the best confirmation that we are doing the right thing here. I am sure they will excel,” he said. BCPP is a multidimensional FAR project addressing child poverty in the Province of Tavush, sponsored by the Edward and Helen Mardigian Foundation.